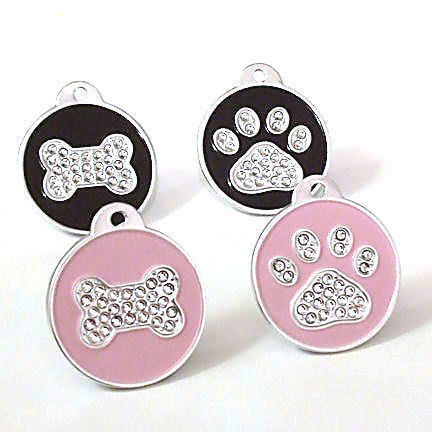 These high quality Round Crystal Pet ID tags are made from silver anodised Alcoa aluminium. The front of the pet tag is filled with a layer of coloured enamel and the design in the centre is made up of clear crystals set into the tag. Each tag comes with a split ring to allow easy fixing to your pets collar. Engraving will be centred and in an easy to read font. The latest computerised engraving machine is used to give perfect clear engraving. If you go over the recommended count then the text becomes smaller, and harder to read. Please advise us of your engraving instructions using either the comments box at checkout, our Contact Us form or by separate email. Please remember to double check your spelling and phone numbers before sending them to us. Please type your engraving information as you would like it to appear on the tag as this will be copied and pasted. If after you have submitted your engraving information to us, you notice an error please contact us straight away to correct this before it is too late as mistakes cannot be corrected.once engraved. We do not accept returns on personalised items that are misspelled unless the fault is ours, in which case we will of course replace it. If your item is damaged or faulty please contact us prior to return as per our returns policy.